The reason we have the Sicilian Mafia is because the Royal Navy was tired of their sailors getting scurvy. OK, OK, calm down Mr. Salmon. I know it’s not entirely as straighforward as that. But believe it or not, that’s not a bad approximation. Starting in 1795, The British required their naval ranks to eat lemons in order to protect against scurvy. Being a formidable empire and all, with an enormous Navy, this required a lot of lemons. And if the British were doing it, well, a lot of other people were going to do it, too. So the worldwide demand for lemons was constantly increasing, and at this point in history, lemons didn’t come from a whole lot of places. If you could grow them, you were assured a lucrative export business. And it just so happens that one of the primary places that could grow lemons in abundance was the island of Sicily. There’s a reason you’ve never heard of the Italian Empire. And it’s not because there wasn’t one. There was. The reason is that compared to the more impressive empires with which it was contemporary, it was pretty anemic. Yes, despite having one of the most expansive empires in history when it was The Roman Empire, afterward the occupants of the region we call Italy never seemed to regain their once-unique talent for conquering the world. And more to the point, even to this day, they’ve actually had a lot of problems just keeping their own territory under their control, Sicily being the primary example. Sicily was still largely feudal up until 1812. It was essentially a loose collection of barons whose estates comprised the primary governing structure to the extent the island could be said to have one. But the British would eventually come to occupy Sicily during the Napoleonic Wars (amusingly arriving on ships whose sailors ate Sicilian lemons), and in 1812, they decided it was time to modernize things. They did away with the concept of feudal land ownership and replaced it with the much more trendy concept that land could be bought and sold on the open market. In some sense, you might say 1812 was the year that capitalism came to Sicily. Capitalism and violence have a very special relationship. Since I don’t want to get Ayn Rand too riled up (posthumously), let me simply say that the “free markets” of capitalism, however you would like to interpret that term, don’t operate in some magical realm where violence does not exist (I think she’d probably agree with me on that). Violence is a reality of life, and economic systems have to deal with it one way or another. In most modern states, as I discussed last week, one of their primary functions is to maintain a monopoly on violence. The state creates the laws, enforces them, and prevents others from deploying violence to further their own ends. When the state is functioning in this way, it creates favorable conditions for capitalism’s “free markets” to exist, because the people who participate in those markets have some reason to believe that published rules will be followed, and negotiated contracts will be upheld. But if there isn’t a public entity maintaining a monopoly on violence, then a capitalist system deals with violence the only other way it can: by incorporating it. So here Sicily was at the dawn of the 19th Century, briskly introduced to capitalism and ultimately left in a state where no real authority was being asserted. The British had undone baron control, but did not succeed in creating a strong local government. They eventually left entirely. The Italian government of the mainland, on the other hand, never devoted sufficient resources to come in and establish firm rule over the island either. Thus Sicily was left in precisely the condition where no public monopoly on violence would ever be established. Of course, this was all happening at the same time as the citrus export business was beginning to boom. There was a tremendous amount of money to be made on exports, so the incentives to create a functioning economy were considerable. But since there was no state actor establishing a monopoly on violence, Sicily was left to go through a long and protracted process of privatizing the enforcement of agreements necessary for commercial activity. The end result was the Sicilian Mafia. “Protection money” is essentially paying rent on violence. At the risk of oversimplifying things — which is unfortunately a bit necessary if this blog is to remain accessible (with apologies to Mr. Salmon, who prefers long and sprawling entries) — we can now paint a more contextual picture of what “The Mafia” actually is as an entity in real life, separate from its many fictional portrayals. As the years passed in Sicily, haphazard use of violence by individuals or loose collections of violent men became increasingly organized. Without a state monopoly on violence to ensure that your lemons weren’t stolen from the trees on your estate, that they would get to the port without disappearing, that the shipping company you sold them to would actually pay you, etc., etc., you had to do something to actually ensure that your business could function. And that something came in two forms. The first form was that you could start your own makeshift police force. You could hire people who would deploy violence on your behalf to ensure that your business was treated fairly. Or, maybe if your force was particularly strong, better than fairly. The second thing you could do was find someone else who had done that, and pay them to protect you. Hence the origin of the main thing we all associate with the Mafia: protection money. Yes, the inhabitants of Sicity didn’t have a reliable public sovereign, but for all intents and purposes they were free to rent a private one. And so the traditional Mafia was born, not as some kind of shadowy criminal underworld made up of the disadvantaged or poor who had no other option, but rather as a integral if unsavory part of Sicilian society that grew out of the need to organize violence when no traditional government was able to successfully do so. Which brings us to Palermo. Palermo is often strongly associated with the Mafia for a very good reason. It was the port city through which ran the majority of the Sicilian export trade, and it played a major role in the development of the Mafia over the course of the 19th and 20th centuries. 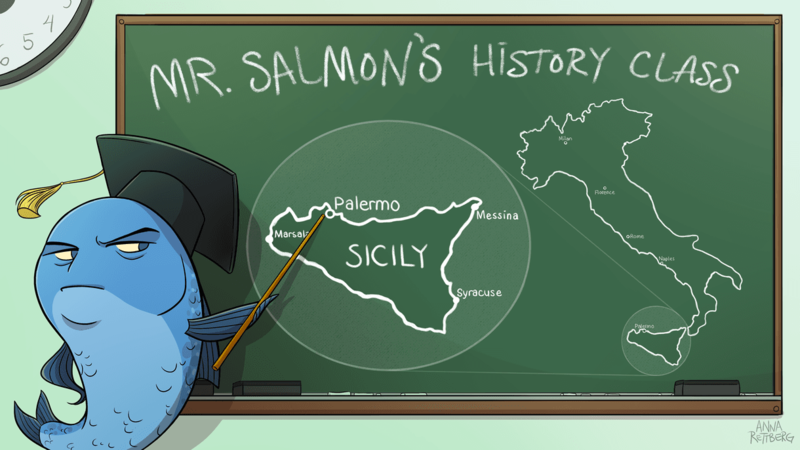 And that, as you may have guessed by the prophetic pointing of Mr. Salmon’s worldly baton, will be the subject of next week’s post.